Alongside the relatively standard two- and four-disc Blu-ray releases, the company had also planned to release a special, limited edition 10-disc collection (see above) that includes The Avengers, all of the extra content found in the aforementioned two- and four-disc releases, as well as all of the Marvel superhero movies released prior to The Avengers that help set up that film’s background story. This means that prospective buyers would own Captain America, both Iron Man films, Thor and 2008’s The Incredible Hulk (which is not to be confused with Ang Lee’s 2003 cinematic exploration of Marvel’s giant green rage monster). That’s quite an impressive set, even at its proposed $220 price point, but thanks to a new lawsuit it seems that Marvel Studios may have to go back to the drawing board on this collection. 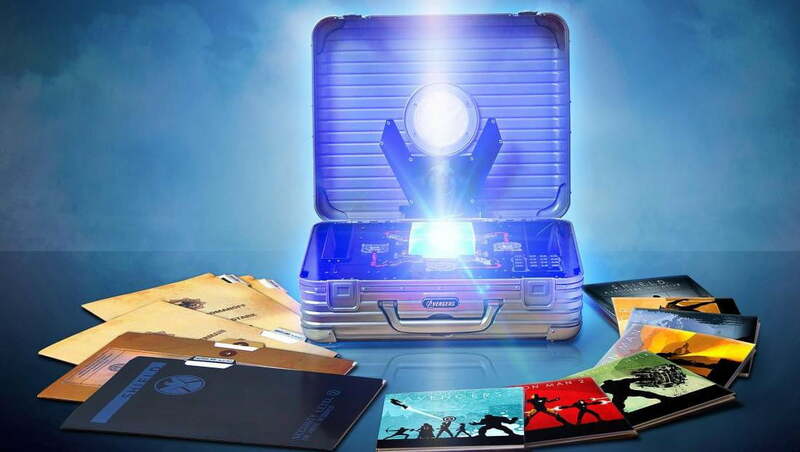 Rimowa GmbH, a German luggage firm, claims that Marvel’s use of a faux briefcase in the 10-disc collection directly damages one of the firm’s key trademarks. The Marvel briefcase, Rimowa believes, is based wholly on the design of its “Topas Attache” briefcase, a sharp-looking aluminum number that suggests both excellent, subtle taste and the idea that its holder is someone of great importance. It also features a $750 price tag, so as long as you’re among the set that prizes conspicuous consumption above all things the case also suggests that you’ve got tons of cash — a crucial feature when one is shopping for the adult world’s answer to the Trapper Keeper. Those of you who clicked through that last link may recognize the Topas as the briefcase used by Samuel L. Jackson’s Nick Fury character throughout the past decade of Marvel Studios films. Rimowa has no problem with the Topas being used in the films, and even provided each movie with a set of cases to use. The problem, according to the German firm, is that Marvel Studios never received permission to recreate the suitcase for its big 10-disc collection. The idea was that the whole bundle would come packed inside a case that looks identical to the one Fury uses in the collection’s films, though obviously Marvel didn’t see the wisdom in massively jacking up the price of its collection purely so it could include a genuine Topas therein. Rimowa, in turn, believes that by creating an aesthetic replica of the Topas, Marvel Studios has directly violated the company’s trademark on the design. Rimowa’s lawsuit alleges “trademark infringement, trademark dilution and unfair competition,” and, according to The Hollywood Reporter, seeks “all profits from allegedly unlawful conduct and an award of three times plaintiff’s actual damages to be proved.” Given how massively successful Marvel’s superhero films have been, particularly The Avengers, the actual figure Rimowa is hoping to be granted could be quite large. As much as we usually despise the overly litigious nature of modern America, one can’t help but notice that the Topas Attache does look very, very similar to the knock-off case in Marvel’s collection. Anyone with eyes can see that. However, the design is exceedingly simple, and we could certainly see a judge going along with the idea that Rimowa can’t really have a trademark on what is effectively a matte aluminum hexahedron. On the other hand, we could just as easily imagine a judge slapping down Marvel’s design and forcing the company to pay whatever figure Rimowa eventually comes up with. We’ll keep you updated as new information is available.